Chandigarh : Prof Jagat Ram, Director PGIMER will inaugurate a three day Neurology Conference tomorrow at PGIMER. The conference will cover all the fields of neurology including topics like Dementia, Stroke, Epilepsy, Ataxia, Neuro-ophthalmology and many more. 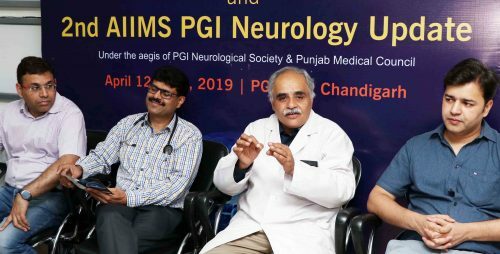 In a joint collaborative academic venture (BRAINSTORM- 2019), first of its kind, PGIMER joins hands with AIIMS, New Delhi along with AINA (Association of Indian Neurologists in America) and IAN (Indian Academy of Neurology) to train budding neurologists from all over the country in the premises of PGIMER, Chandigarh. Starting from 12.4.2019, this conference will last for three days. The conference is the brain child of Prof Vivek Lal (Chairman, Brainstorm, 2019) who is being ably assisted by Prof Gagandeep Singh (Head of Dept. of Neurology, DMC, Ludhiana), Prof Manish Modi (Organizing Secretary) and Dr Rajveer Singh (Joint- Organizing Secretary). Around 40 faculty members from all over India are participating in the conference to train young minds from all over the country. As many as close to 175 DM neurology Trainees have already registered as delegates and likely to obtain benefit from the conference. Among the faculty members, Prof Sanjay P Singh, Prof Prakash Kotagal and Prof Ramesh Madhavan are travelling from USA to enrich trainees with knowledge. Prof Lal told at Press conference that the primary theme of the conference is an algorithmic approach to aid quick and easy learning. The collaboration will also mediate the formation of standard operating protocols offering uniform treatment for all the institutes across the nation. He was especially thankful to Prof Hassan Hosny, Chair of Neurology Department, Cairo, Egypt who is already in the city beautiful to share with experience with young neurologists of our country. He also mentioned that several new learning initiatives including easy to understand tools, like mobile apps, will be incorporated in this conference to add to learning. Other notable faculty members who will teach students include Prof M V Padma (Head of department of neurology, AIIMS, New Delhi),Prof Sudesh Prabhakar (Former Head of department of neurology, PGIMER, Chandigarh), Prof Kameshwar Prasad (Former Head of department of neurology, AIIMS,New Delhi), Prof M R Dogra (Head of ophthalmology department, PGI, Chandigarh), Prof Manjari Tripathi (AIIMS,New Delhi), Prof Achal Srivastava (AIIMS,New Delhi), Prof Rohit Bhatia (AIIMS,New Delhi), Prof Mamta Bhushan (AIIMS,New Delhi), Prof Dheeraj Khurana (PGIMER, Chandigarh), Prof Parampreet Singh (PGI, Chandigarh), Prof Sarosh M Katrak (Mumbai), Prof R Laxmi Narasimhan (Chennai), Prof D Chaudhary (Head of the department of neurology, GB Pant Hospital New Delhi), Prof Satish Khadilkar (Mumbai), Prof Vaishali Gupta (PGI, Chandigarh) and Prof Ramandeep Singh (PGI, Chandigarh). Prof Lal informed that the conference will impart young brains a ‘Holistic’ vision about neurological disorders. Another highlight of the conference is the Neurology Quiz for the attendees. The quiz foresees the participation of best brains from India. The inauguration of the conference will be held on 12.4.2019 in lecture theatre complex of PGI, Chandigarh.